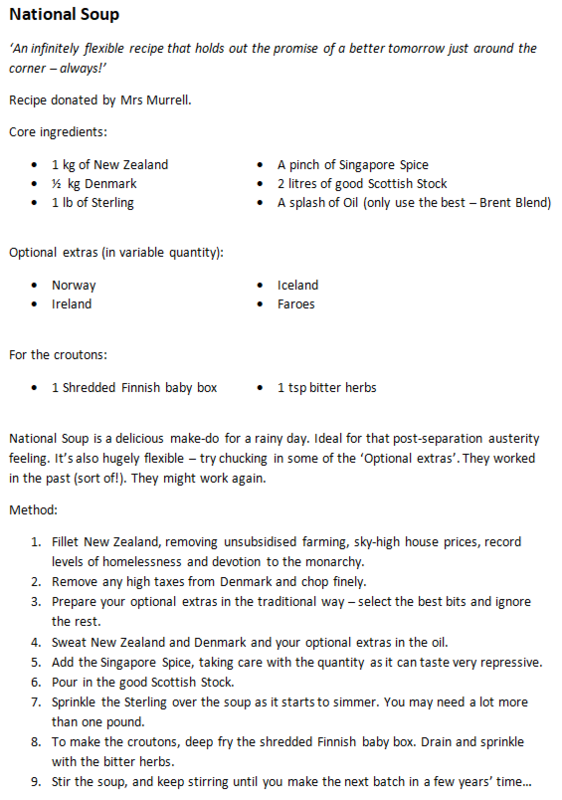 New recipe – National Soup | The Nation said No Thanks! The SNP’s sustainable inter-generational growth (or something) commission launched its report today, to a chorus of dissent from left wing/radical nationalists, not to mention the party’s recent favourite economist Richard Murphy (‘There is a route to Scottish independence – but it’s not via the Growth Commission’s recommendations’) and veteran indy-minded commentator Jim Fairlie (‘What is being proposed wouldn’t be Independence. It is a pathetic apology of a report which the SNP should be ashamed to present’). I’ve not seen any pro-unionist or academic comments yet so it looks as if in-house nationalist critics are doing the job for everyone else. Doubtless serious commentary will follow but in the meantime you may wish to savour an item that seems to have been missing from the launch press pack. Apologies if you saw this on Twitter. I’m an avid recycler. This entry was posted in Uncategorized and tagged Growth Commission, humour, nationalism, news, SNP. Bookmark the permalink. Kevin Hague took a shot at the report yesterday, or at least at the pre-release headlines. He admits that he hadn’t seen the thing itself at the time of writing, although he’s added some comments since reading it. From the sound of it I’m not surprised verteran nationalists, especially those on the Left, don’t like it. Honestly, where it isn’t simply “independence will, ipso-facto, make us rich” magical thinking, it sounds (almost) like the sort of thing I could (almost) get behind, although I don’t believe that crowd – or anyone else at Holyrood, for that matter – would ever actually implement anything like it it in a million years.